Scientists now think that planets spinning on their sides might be more habitable than previously expected if they harbor oceans. Planets spinning on their sides were long thought to have climates too extreme for life as we know it on Earth, but now, scientists have found that some of these "rotisserie" worlds might be more hospitable. If these alien planets, which rotate sideways like a pig on a spit, are covered in oceans, they could actually have a mild, springlike climate all year, scientists say, potentially expanding the number of potentially habitable planets where life may be found. One key factor affecting whether a planet might be habitable is its obliquity, the degree to which the axis on which the planet spins tilts.This influences the amount of sunlight any point on the planet experiences over the course of a year. The greater a world's obliquity, the more extreme its seasons are. Earth has a relatively low axial tilt of about 23.5 degrees. However, researchers suspect that exoplanets may display a range of obliquities, resembling anything from a vertical spinning top to a horizontal rotisserie. Scientists had thought that the more extreme the tilt, the less habitable a world would be. "The expectation was that such a planet would not be habitable — it would basically boil, and freeze, which would be really tough for life," lead author of the exoplanet study David Ferreira, a climate scientist at the University of Reading in England, said in a statement. However, Ferreira and his colleagues' new findings challenge those expectations, showing that such extremely tilted planets may remain habitable if covered entirely by oceans. "In the search for habitable exoplanets, we're saying, don't discount high-obliquity ones as unsuitable for life," Ferreira added in a statement. To see what life might be like on habitable planets with extreme tilts, researchers simulated Earth-size planets covered entirely in water circling their stars at the same distance as Earth orbits the sun. The 3D models simulated circulation among the atmosphere, ocean and sea ice on "aquaplanets" with oceans 1.8 miles (3 kilometers) deep and "swamp" planets with relatively shallow oceans that were 33 feet (10 meters), 165 feet (50 m) or 655 feet (200 m) deep. The tilt of Mars' axis varies over the course of its year. When it tilts more, it creates a warmer climate on the planet. When it is less tilted, the Martian climate is colder. The investigators simulated planets at three obliquities. The first was 23.5 degrees, like Earth's. The next was 54 degrees, the point at which the poles receive more annual sunlight on average than the equator. The last was 90 degrees, the point at which a planet is essentially lying on its side — the poles would each point at the star for a quarter of the year, and then away for another quarter, alternating between extremes of light and darkness. Ferreira and his colleagues found that a global ocean would absorb enough solar energy from the star and release it back into the atmosphere for such a world to maintain a rather mild, springlike climate year round. Even a shallow global oceanonly about 165 feet (50 m) deep would be enough to keep a high-obliquity planet at an average of about 60 degrees Fahrenheit (15.5 degrees Celsius) year-round. "The most surprising result here is how little ocean is needed to maintain a mild climate at the poles, even in the heart of winter and summer times," Ferreira told Space.com. "We were not expecting how efficient an ocean, even a shallow one, would be at mitigating temperature." 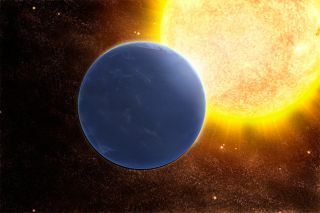 Past research had suggested that great differences in temperature between the dark and light sides of a high-obliquity planet might lead to powerful weather. However, the scientists did not seea strong difference in the intensity of weather on such worlds compared to the weather on Earth. Instead, "at high obliquity, more active weather occurs in summer, while winters are quiet times in terms of storm activity," Ferreira said. "That is the opposite of what happens on Earth." The simulations found that life could thrive on a highly tilted watery planet, but only up to a point. Waters up to 33 feet (10 m) deep would not absorb enough heat to help keep planetary climates habitable. Instead, as soon as ice formed on the dark side of such a planet, the ice would quickly spread. The resulting massive ice sheets would reflect the rays of the planet's star, keeping the planet cold and helping the ice spread further. The resulting runaway effect would eventually envelop the planet in ice. "Some people have thought that a planet with a very large obliquity could have ice just around the equator, and the poles would be warm," Ferreira said in a statement. "But we find that there is no intermediate state. If there's too little ocean, the planet may collapse into a snowball. Then it wouldn't be habitable, obviously." In the future, the researchers may simulate worlds covered with both land and water. Ferreira and his colleagues — John Marshall, Paul O'Gorman and Sara Seager, all at MIT — detailed their findings in the Nov. 15 issue of the journal Icarus.